Cost-effective and efficient multi-purpose systems for low temperature applications. Grant low temperature circulators provide a source of precision cooling for many sensitive analytical procedures including spectrophotometry, viscometry, refractometry and electrophoresis. They are suitable for use in both open and closed loop circulation (i.e. remote vessel open or closed). Alternatively, Grant RC series of recirculating chillers (closed circulators) can be used. These are generally needed for more powerful cooling requirements, e.g. the removal of mechanical or electrical heat produced in apparatus or machinery. The four Grant Optima™ thermostats can be combined with the five Grant refrigeration units to provide a choice of 18 models. The Grant Optima™ LTC2 Kit includes TC120 heating circulator and R2 tank/refrigeration unit. The TX150 - R4 is available ready assembled with the circulator mounted on the refrigerator and supplied with insulated tubing and clips to form a system ready to use. 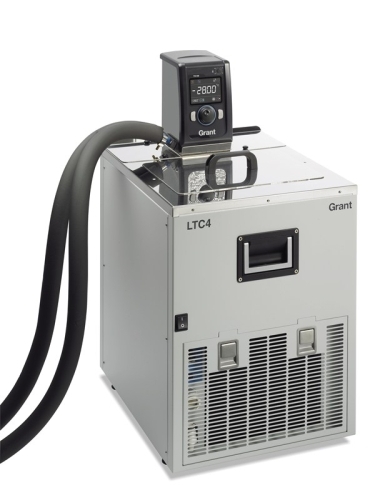 The Grant Optima™ LTC4 Kit includes TX150 heating circulator and R4 tank/refrigeration unit. The Grant Optima™ TX150 is a high-performance programmable digital heating circulator with an exceptionally simple user interface. This allows fast set-up of multiple parameters through a powerful menu system and provides sophisticated control for temperature-controlled applications. The TX150 has USB connectivity to a PC or laptop. It is programmable with Labwise™, a software program to set all parameters, including programs, via the PC. Labwise™ also features real-time status windows, a graphic display of the controller's performance as a program is run, and allows data to be logged for future recall and analysis. The TXF200 heating circulator incorporates Intelligent Control OptimisationTM (ICO) for adaptive intelligent PID temperature control and includes a powerful integral pump, making TXF200 series refrigerated systems suitable both for immersing samples and circulating temperature controlled fluid to external devices. The temperature range and heater power are automatically limited according to the liquid type selected. The Grant Optima™ TXF200 is a high-performance, programmable digital heating circulator and features a full colour QVGA TFT screen displaying actual and set temperature and clear status icons. Intuitive screen icons and menus allow fast set-up of multiple parameters and provides precision control for both routine and sophisticated temperature-controlled applications in the range of -50 to 200°C. USB interface allows connection to PC/laptop for programming or data logging. It can be used with Labwise™ software, program to set all parameters, including programs, via the PC. Labwise™ also features real-time status windows, a graphic display of the controller's performance as a program is run, and allows data to be logged for future recall and analysis.